Making your own jewelry is fun and exciting. Designing your own jewelry piece is thrifty, chic, and creative. However, sometimes it can be a bit costly. All of those beads and all that wire add up over time. So what is a obsessive DIY jewelry fan like yourself to do? Try crafting jewelry out of items you already own. In this collection, How to Upcycle Jewelry, you will learn how to turn bits and baubles and scraps into one-of-a-kind jewelry creations. Stop starting from scratch with your DIY jewelry making. Upcycling your old, abandoned accessories into fresh new pieces is a wonderful way to make new and unique jewelry projects. From those gaudy clip-on earrings from the '80s collecting dust in the bottom of your jewelry box to a dated handbag, old accessories can be given new life and new use with just a small dose of creativity. Be resourceful and revamp, reinvent, and recycle items in your home right now to design these beautiful homemade jewelry projects. It happens to everyone. You have a beloved piece of jewelry and then a piece of it breaks. But it does not have to be a tragedy. You can re-use parts of old jewelry pieces to create brand new beautiful jewelry designs. Make rings and necklaces out of vintage clip-on earrings, re-construct a necklace using beads from a old favorite, or repurpose broken of buttons to create charms and pendants. The possibilites for repurposed old (and well-loved) jewelry pieces are endless. Sometimes you have a jewelry piece that is still intact, but it is just a little dated. Never fear, you can create a dazzling new DIY jewelry design from old or inexpensive jewelry pieces. Just a little paint and a vibrant new hue will make you feel like you are wearing a brand new store-bought design. Don't have an old jewelry pieces to revamp or recycle? That's okay! 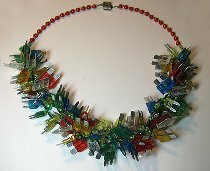 You can still make upcycled jewelry designs out of other household items. Whether its an scarf, a couple of seashells, or a shopping bag, all you need is a little creativity to turn every day items into a cool new jewelry creation. Looking for more thrifty jewelry making ideas? Check out this collection, Chic Recycled Crafts: 14 Recycled Jewelry Tutorials!